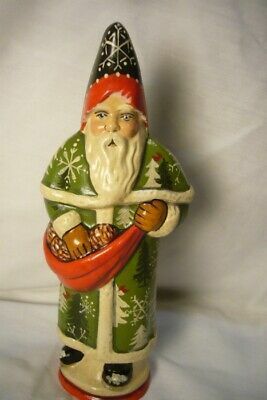 Vaillancourt Folk Art Santa & Pinecones Collector's Wkd signed by Judi! One of the two Collector's Weekend Pieces a Wonderful Forest Green Santa with his Coat Covered in Pine Trees and Sack Full of Pinecones. He measures 9 inches and is in perfect condition. Another Christmas Keepsake Designed by Judi Vaillancourt and Painted by the Vaillancourt Artists.